Obituary for Larry B. Small | Kenworthy Funeral Home, Inc.
Larry B. 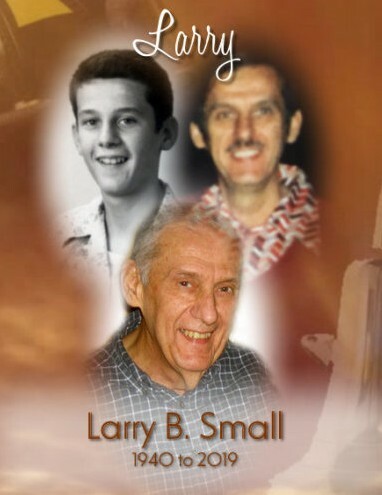 Small, 78, of Spring Grove, PA, entered God’s eternal care, Friday, March 29, 2019 at the Spring Creek Rehab Center, Harrisburg, PA.
Born September 10, 1940, in Hanover, PA he was the son of the late Francis W. Small and Lorena G. (Zartman) Small Sentz. Larry was a 1958 graduate of Eichelberger High School. He was a veteran of the United States Army having served his country proudly during the Vietnam War. Larry retired from P.H. Glatfelter, having worked as a fireman for thirty-eight years. He was also a member of the quarter century club. Larry enjoyed working, animals, and taking care of his family. Larry is survived by his children, Sherri L. Gagnon and husband Rustin of Efland, NC, Tracy L. Haas and husband Matthew of Enola, PA, and Holly A. Small of Highspire, PA; 1 grandson, Evan Haas of Enola, PA; one brother, Robert J. Small of Lakeville, MA. He was preceded in death by a brother, Gordon E. Small; and a sister, Jean F. Zinn. A funeral service to celebrate and remember Larry will be held at 11:00 AM, Wednesday, April 3, 2019 at the Kenworthy Funeral Home, Inc., 269 Frederick Street, Hanover, PA, with the Rev. Philip K. Nace officiating. Burial will be in Rest Haven Cemetery, Hanover, PA. A viewing and time to share memories with the family will be held from 10:00-11:00 AM, Wednesday, April 3, 2019 at the funeral home.